Enjoy being healthy and proud of your decision to HAVE A HEALTHY BODY and HAPPY MIND forever. This recording comes from personal experience and clinical success. The goal is that you will begin to overcome anorexia and begin to learn to eat the way a lean, happy and healthy person eats. 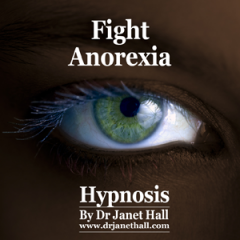 Hypnotherapy can help with anorexia nervosa by helping you change the automatic thought patterns that have created such a destructive cycle in your life. Hypnotherapy works with your unconscious mind to help you associate confident, happy times of your life with the situations that would otherwise trigger anorexic behaviour. The recording works in a gently relaxing way to establish better and healthier patterns of thinking, feeling and behaviour at a more unconscious level. If you have been fighting anorexia nervosa than you will know how exhausting it is. You also may well have been in intensive therapy or perhaps in hospital. The combination of tiredness and repeatedly not finding something that helps is very distressing, obviously, and there is a danger that you may listen to this recording a few times, notice that nothing seems to have changes, and say to yourself ‘I knew that nothing could help me get rid of my anorexia’.